and perform chamber music of the early 19th century. Beginning during a casual conversation with Christopher Monk in 1991 and continuing through the years with other brass players and instrument designers, Berlioz Historical Brass has sponsored the development of a mouthpiece that permits modern low brass to sound similar to a serpent. Now players of the euphonium and baritone horn have the opportunity to obtain a more authentic sound for parts originally scored for the serpent. The rescoring of historical instruments has always been a problem. The unique timbre of the serpent creates sonorities and a blend of sound that is rarely achieved on modern low brass. But such compromises are willingly made by today's players in recognition of the difficulties of taming the serpent and overcoming its many challenges. The question would always be posed: can a mouthpiece be designed that produces the characteristic sound of the serpent? Representing a collaboration among researchers, players, and craftpersons throughout the decades, Berlioz Historical Brass is pleased to announce the Rogers Mouthpiece. replica of an 18th century serpent mouthpiece, in ivory. After conversations with serpent makers Monk, Keith Rogers, and Steven Silverstein, Craig Kridel invited Douglas Yeo to conceive a mouthpiece that could produce a warm, breathy, serpent-like sound on euphonium. Yeo and Kridel had already been in conversation about the sharp-throated mouthpieces of bass horns and mid-19th century trombones (in preparation for the Berlioz Historical Brass premiere performance of Mendelssohn's Seasons), and Kridel had been experimenting with serpent mouthpiece design of the 18th century and examining the decisions and compromises made in the late 20th century to negotiate a “serpent sound.” Yeo notes that the serpent, “being made of leather-covered wood, has a unique timbre that cannot be adequately simulated by modern brass instruments. In the quest to develop brass instruments with greater purity of sound, we have lost the ability to blend well with both voices and woodwinds, something the serpent was able to do with great success." Yeo developed a metal prototype, made by Robert Osmun, and the mouthpiece was named in honor of the late Keith Rogers who continued and extended the designs of serpents and their mouthpieces as the leading craftsperson at Christopher Monk Instruments. Decisions were made to introduce aspects of historical instruments to the modern low brass player: the mouthpiece would be produced in wood to replicate more of a “chamber music sound," and the shank would be wrapped by the player in order to achieve a comfortable fit. J.c. Sherman, instrument maker and technician, was subsequently commissioned to begin developing the designs with Yeo and experimenting with types of wood for production. Sherman states, “we wanted to continue the efforts of Keith Rogers and Bob Osmun, keeping the feel light and flexible and the material affordable. We settled on a tenor and a bass rim suitable for players of larger instruments. Both rims had to create the sound of the serpent with the characteristic feel of modern brass.” Presently, two sizes of Rogers mouthpieces are available: the Rogers 255 (with an inner rim diameter of 25.5 mm) and the Rogers 280 (with an inner rim diameter of 28 mm), both maintaining a modern trombone/ euphonium rim. 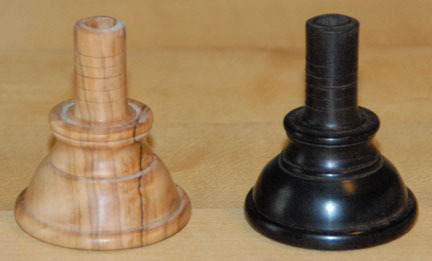 The mouthpieces may be ordered in either blackwood or olivewood. With the Rogers mouthpiece, repertoire from the late 18th and early 19th century becomes accessible to the modern low brass player. This mouthpiece project, in conjunction with the original mission of the Historical Instrument Section of the International Tuba Euphonium Association Journal, seeks to introduce modern players to the various roles of historical brass instruments rather than attempting to persuade musicians to play the serpent. As one professional tubist said after playing a euphonium with a Rogers mouthpiece, “now I can finally play the Haydn Divertimento and other chamber ensemble works from the early 1800s.” For those low brass players who wish to explore the early 19th century harmoniemusik literature and to produce a more authentic sound for the serpent part of Mendelssohn's “Reformation” Symphony and other serpent-scored, orchestral parts, the Rogers mouthpiece brings forth new opportunities and exciting possibilities. For those players who wish to explore harmoniemusik repertoire, please visit our listing of Berlioz Historical Brass-sponsored music editions. Go to Music commissioned by Berlioz Historical Brass and Harmoniemusik. The Rogers Mouthpiece—commissioned by Craig Kridel after discussions with Christopher Monk, Keith Rogers, and Steven Silverstein, designed by Douglas Yeo, and produced by J.c. Sherman—offers today's players of the euphonium and baritone horn the ability to produce the historical sound of the serpent.